For those of you that aren’t particularly Internet savvy, eBay has become quite a powerhouse in on-line retailing. At this site you can purchase virtually anything. I personally use eBay for selling a few things, but many pinewood derby vendors use eBay as their primary retail outlet. 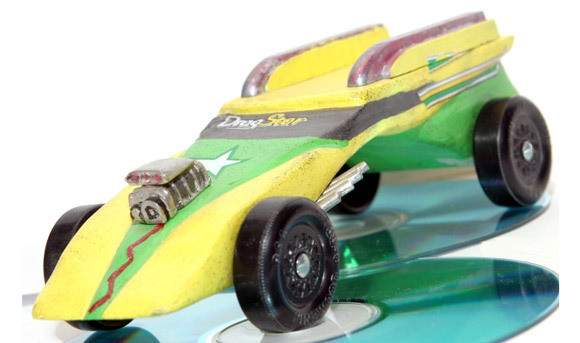 In most cases this is great for the pinewood derby community, as it allows many unique products to become available to the pinewood derby shopper. As always, buyer beware is still mandated, but generally you can find quality products at good prices. But as is often the case, there is a dark side – the selling of completed cars.1 Generally these cars are marketed to the parent as a “guaranteed district winner”, or a “super fast car to give you the edge”. Some have professional paint jobs, others are (supposedly) designed by people with PhDs in physics, and a few look like they were built in a model shop. As I will share below, I have issues with this thought process. I doubt that I will convince those of you that have taken part in the dark side, but hopefully I can persuade those on the fence to reconsider. But first I do want to mention that there is one legitimate reason for buying a completed car. That is, to add a car to a collection. Sometimes beautiful, vintage cars are sold on eBay. They are not legal for a race (obsolete kit type), but they certainly would make a nice addition to a collection. Also, some cars made from modern kits are sold that are so nice that I can see someone buying them to put on a shelf. But these offerings are few and far between during the madness of pinewood derby season. “Do your best” – That is, do everything you can within the rules to build the fastest car possible. Learn, then work smart and work hard to achieve the goal. “Parent-child project” – Make sure that the child takes part in all aspects of building the car. Clearly the amount of participation will vary from age to age, and from child to child. But the intent is for the child to have ownership of the project and of the completed car. These philosophies are in harmony with the intent of the pinewood derby as espoused by the various clubs and organizations that sponsor these races. Following these philosophies may involve learning about physics, mechanics, and wood-working. It may involve purchasing some products. But fundamentally, the rules are followed, a car is built, and the child is fully involved. Hard work is not necessary to succeed. Do these sound familiar? Certainly some top executives in America’s corporations follow these philosophies. But now many – as they await trial or reside in prisons – have discovered that these philosophies are ultimately destructive. These philosophies are the direct opposite of what I believe we should teach our children. They will eventually discover that these philosophies exist and are practiced by some. But I believe that a solid ethical foundation and a “do your best” philosophy will ultimately pay off. In addition to teaching the wrong philosophy, the purchase of a completed car (instead of building the car) also demonstrates the wrong priority to our children. Earlier I stated, “Why ‘waste’ time making a second rate car when I can buy a winner.” Clearly, spending time with your child is never a ‘waste’ of time. Children will always remember time spent with their parents, while the memory of a particular trophy win will in itself wane. Our kids crave time with us. They want to be with their parents (well, at least until they become a teenager). Yet we are often ‘too busy’ to spend time with them. By purchasing a pre-built car, we are essentially telling our child, “I don’t have time to spend with you, so instead I will buy you something.” Is this the message you really want to send? One valid concern that is often raised by parents is: “We worked hard and did our best, but the car wasn’t competitive and my child was heartbroken. In our case, ‘do your best’ didn’t work out.” My response is that this perspective is too short-term. People commonly do not succeed on their first attempt. Could you ride a bicycle the first time you tried? Did Nolan Ryan throw a no-hitter the first time out? Did Thomas Edison invent the light bulb on the first try? (It took him over 1,000 attempts.) Do all businesses succeed? (Over 50 percent fail in the first year, and the vast majority within five years). One of the chief ways we learn is through failure. It is oftentimes failure that gives us the motivation to learn more, to try a different method, to work harder, and to work smarter. On a personal note, I had two business failures before starting Maximum Velocity, and it was failure in one of our early pinewood derby races that initiated my effort to learn more about making fast cars. So, what do you do if you did you best building a car, but it wasn’t good enough? Get on the Internet and learn. Information can be found for free, or purchased for a few bucks. If you have the desire and budget, get a few tools. But the main thing is use the ‘failure’3 as the motivation to do better, not to give up or give in to the dark side. Another concern voiced by parents is that they have no equipment to build a car. There are several solutions to this dilemma including asking a neighbor to help, purchasing a pre-cut kit, some components, or some tools, or making use of workshops sponsored by the organization. Don’t use this as an excuse to take the big shortcut. There are other dilemmas as well, but I don’t believe any of them justify purchasing a completed car. Ultimately we want what is best for our children. To me, this involves teaching our children to be ethical and to strive to do their best. But we can easily get sidetracked, and try to take shortcuts to success. When we do this, we teach our kids that the goal is more important than the path taken. I encourage you to make sure that you put your kids on the right path and stay away from the shortcuts. Don’t succumb to the temptation to buy a victory, as it will ultimately leave a bitter taste. 1Although it was not my intention, this article will likely offend some of you who sell completed cars on eBay. I hope that you will at least consider my concerns, and then reconsider your product offering. Instead of selling completed cars, how about car kits? With kits, the parent/child team will put some effort into building the car. 2Virtually all rule-sets state in one manner or another that a car must be built by the parent-child team. 3Failure relates only to the race standings. Any time spent with your child is not a failure. He’s right. He was there to help develop the design, draw the car, and dream with me through the details of tricks we used to make a fast car. I explained every detail of our construction process so that he knows why we polish the axles, why we need a sleek aerodynamically clean design, why we need the weight back in the back, why we run on three wheels, etc. Our pack passed out rule sheets in advance stating what could and couldn’t be done. We chose to limit our modifications to stay in the scout class with original wheelbase, length, and width, and limited wheel/axle work. Sparky went on to an undefeated season setting track records at the pack and district races, and taking second in best of show at district. Even modified division cars couldn’t catch Sparky. Overall Sparky earned five trophies. With graphite splatter still on the body, this car took 2nd Place at a Girl Scout event, and then took 1st Place at an adult race. The body was first sawed out, then hand filed and sanded. The weight is set at 80 percent on the rear axles and 20 percent on the front axles. My wife thought I was nuts to spend so much time on the car. Here is the car that my son and I made last year. My oldest sons are both at the Naval Academy and desire to be pilots. 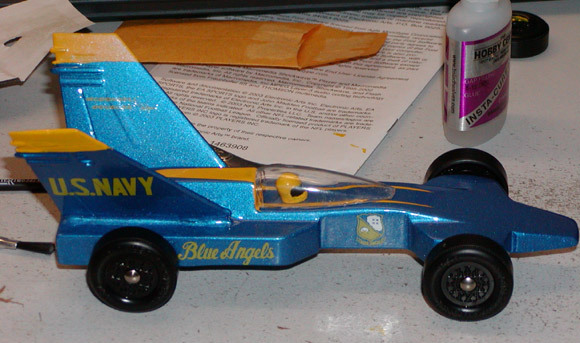 So we decided to honor them with this Navy F-18 Blue Angel theme car. We used a pre-formed block, made some shape modifications, and confiscated some parts from a Revell model kit. An automotive paint job was then applied, and the results were fantastic. Not only is this car a looker, but it is fast as well. My son won 2nd in the Pack meet, 2nd in the District, and 2nd in the Council. Perhaps if the afterburners worked, we might have gotten a 1st Place somewhere in there! When my son was a Bear in the Cub Scouts, we had just moved into the area and his pack was going to be having their annual Pinewood Derby Race. The year before, in his old pack, he and I built a car that took third overall and won the show and shine award for best paint job. 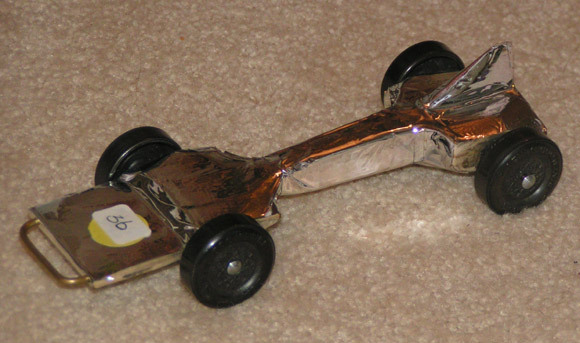 So, we thought we could do well in the Pinewood Derby in his new pack; but we were wrong. When we went to weigh in his car that year I could tell right away that the cars in my son’s new pack – with the sleek designs and cool paint jobs – were on a totally different level than we were. In the double elimination race, my son’s car was eliminated in the first two heats. After that race I knew that we would have to do something different for next year. The following year my son was in the Weblos group, and it would be his last year to race with the Cub Scouts in his new pack. After doing a little searching over the Internet, we designed a car that was sleek looking, and we implemented some of the speed tips I was able to find. My son, my wife, and I were all amazed and shocked when his car went undefeated that year in his pack, and was able to advance to the District race. We were further amazed when his car went undefeated in the area race and took second in the District for the Weblos that year. After the race we were informed that there was going to be a Council race that year, and the top two in District could go. At the Council race there were some pretty fast looking cars, and we were not sure just how well his car would do. However we were both surprised, because at the end of the race he had finished second in the Weblos just behind the same car he came in second to at the district race. The best part was after they had awarded him his trophy (which was a big one), he had to walk back to the car which was located at the opposite end of the fair grounds through the thousands of scouts that were there. I could tell that he was on cloud nine because the whole way across the fair grounds he was stopped by friends and other scouts that wanted to check out his car and his trophy, and he was glad to share his story with them. I used your Pro-Body Tool for drilling axle holes. Works great! I can push the axle in with my thumb and it is pretty snug. After everything else is done, would you pull out the axle and put a drop of super glue down the hole and reinsert the axle? If the axles are really snug, then glue isn’t necessary. But if you choose to glue, then I suggest white glue instead of superglue. Just put a tiny drop on a toothpick, swirl it in the hole, wipe off any excess, and then insert the axle. I avoid superglue as it has a nasty habit of getting into the wheel hub and locking up the wheels. It appears that we have made our front axle slot too wide. The front axles are loose and do not fit snuggly. I am using some wax paper shims to hold the axles in place, but it is difficult to keep them in the proper position so that they can be aligned correctly. Do you have any suggestions on how to correct this problem? Sorry to hear about the problem. Here are some alternatives. You can start again with a new block (but I’m sure you have thought of this). You can plug up the slot and re-cut. Glue a strip of wood (popsicle stick, basswood from hobby shop, etc) into the bad slot. After it dries, trim and sand. Then re-cut. I have heard that you can fill the slots with epoxy, and then re-cut when it dries. Dried epoxy is very hard to cut, so I would do this only if you cannot find wood to glue in the slots. You can use thicker shims, but I think you will continue to have problems unless you patch and re-cut. I have noticed that some wheels at our race are very shiny; it seems that they have been polished with graphite. Is there any advantage or disadvantage to this? Any suggestions on how to do it? I think that applying a thin layer of graphite on the contact surface is beneficial. We do this by dipping a finger in powered graphite and rubbing it on, then gently wiping off the excess with a clean rag. But I think what you are seeing is wheels that have been coated with a graphite/moly spray. This is more aesthetic than anything. Obviously, the coating on the non-contact areas does nothing, and may detract if it adds weight to the wheels.